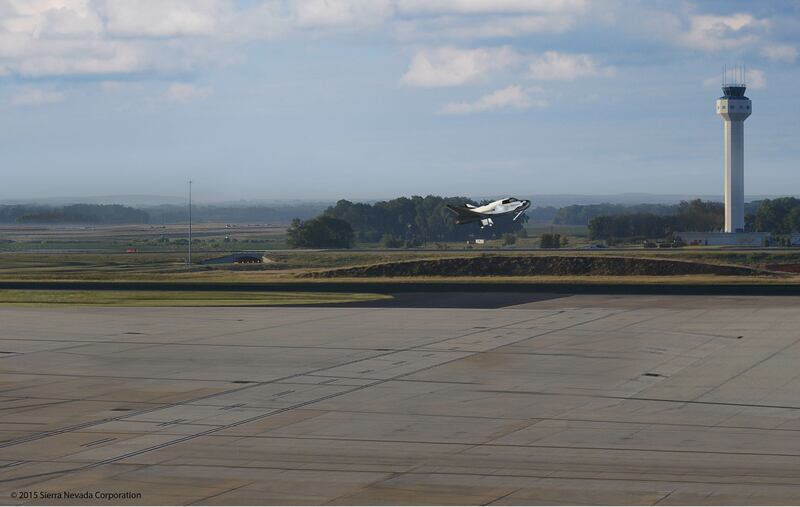 PARIS – Huntsville International Airport could become the first commercial airport to handle landings of the Dream Chaser, the spaceplane being developed by Sierra Nevada Corp. for supply trips to the International Space Station and other missions. At the Paris Air Show today, Huntsville leaders announced they have launched preliminary studies to assess the possibility of Dream Chaser landings at the city’s airport. 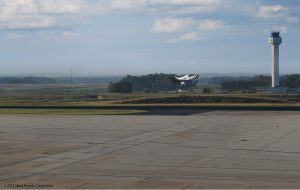 The initial inquiry will focus on environment factors such as the whether the Dream Chaser is compatible with the infrastructure at Huntsville International Airport. Sierra Nevada is advancing the Dream Chaser in the current NASA competition to supply cargo to the International Space Station. Sierra Nevada also plans to operate the vehicle on other missions, tailored to a variety of U.S. and international customers. Like the Space Shuttle, the Dream Chaser launches on a rocket and lands on a runway. Because the Sierra Nevada craft is much smaller than the now-retired shuttle, it is able to land on any runway that can accommodate a Boeing 737 or an Airbus A320, the top-selling single-aisle passenger jet categories. At a press conference today in Paris, John Horack, vice president for commercial space imaging at Teledyne, said Alabama is an ideal spot for Dream Chaser landings. If preliminary assessments are successful, the study’s second phase could begin later in 2015, which could culminate in Federal Aviation Administration approval to land the Dream Chaser in Huntsville. Strong added that the attempts to secure Dream Chaser landings fit in with an overall strategy of expanding aerospace employment in North Alabama. The area is already a major player in the U.S. aerospace and defense sector, with large government installations and the presence of Boeing, Raytheon, Lockheed Martin and all other major aerospace companies. The initial studies on possible Dream Chaser landings will be performed by Huntsville’s Teledyne Brown Engineering, with support from RS&H Aerospace and Morell Engineering, based in Athens, Alabama. “The technical and economic benefits of landing Dream Chaser here in Huntsville are significant,” said Horack of Teledyne. “Imagine being able to bring back critical or fragile payloads from space, and having them in a laboratory at Marshall Space Flight Center, Redstone Arsenal, Hudson-Alpha, or elsewhere, within mere minutes of touch-down. “No other vehicle and no other region are so well-suited for each other, to accomplish new and great things in tomorrow’s commercial space economy,” Horack added. The Dream Chaser study is being initiated by a coalition that includes the City of Huntsville, Madison County, the City of Madison, the Huntsville/Madison County Chamber of Commerce, and the Huntsville-Madison County Airport Authority.